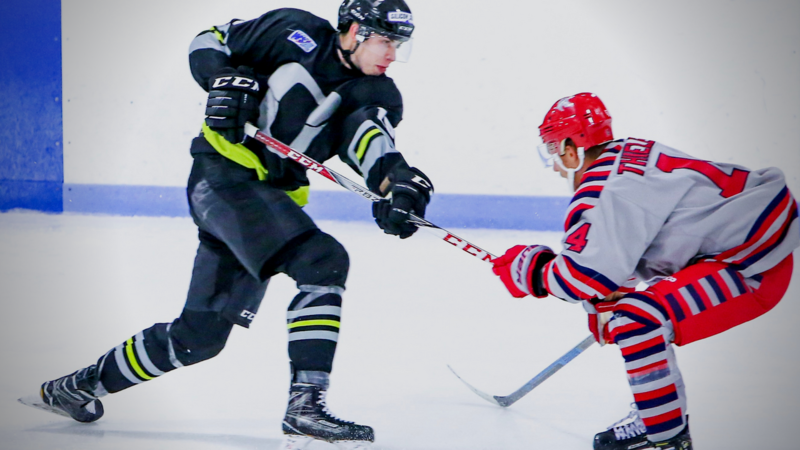 Returning to the Acord Ice Arena this past weekend, the Utah Outliers once again stared down a familiar foe in the 1st place Ogden Mustangs. Coming into the two game set, Ogden was holding a record of 36-1-1, and had beaten Utah in all four previous contests. The Outliers have been no slouch themselves, sporting a 24-12-1-1 record and comfortably in second place in the Mountain Division and fifth place in the league. These past two games did not disappoint as each team showed exceptional quality play throughout the weekend, and also showcased to the rest of the WSHL that they are two of the strongest teams in the league. In Game one of the series, both teams started out trading blows and feeling each other out. Both the Mustangs and Outliers displayed stalwart defense, allowing 10 (OGD) and 9 (UT) shots respectively. Each team had some decent offensive bursts, but both Artur Ogandzhanyan and Oscar Wahlgren were there to halt any scoring threats. Utah began picking up momentum in the second, dictating the play and garnering a bulk of the chances (outshooting Ogden 12-6), however it was the Mustangs who struck the first blow. In the third period, a powerplay saw Ogden double the lead. Utah did not back down and less than three minutes after Ogden’s goal, Nicholas Ness brought the Outliers within one. Two minutes later, Jan Dvorak tied the game and gave the home team all of the momentum as the game neared its end. The Outliers finished the game with a 46-27 shot advantage. Overtime ensued but neither team was able to break through, and for the first time this season, Utah headed to a shootout. Captain Zach Dornseifer set the tone, sniping the first shot right over Ogandzhanyan’s glove hand to give the boys in black the advantage. Fortunately, for the home squad that would be all the team needed, as Oscar Wahlgren would go on to stop all 5 shooters for the Mustangs, preserving the win for Utah. The Outliers came out firing on all cylinders in game two, controlling the puck and peppering the Ogden net for 17 shots while only allowing 5 against. As the story has been all season, Ogandzhanyan stood tall and did not surrender an inch, not allowing the Outliers to get on the board. The Mustangs capitalized in the second frame off of a broken faceoff play, seizing momentum for the visitors. Some questionable penalties then proved to be fatal for the Outliers as the Mustangs converted on back to back powerplays just thirty seconds apart. That would be all the guests’ needed as the home team could not get back on track and return to their offensive play. Through the first two periods, Ogden managed to go 2-5 on the powerplay whereas Utah went 0-1. The third period was a shut down period for the Stangs’ as they gave up only 7 shots (only took 9 themselves) and were able to preserve Ogandzhanyan’s shutout. The two Utah rivals will meet two more times this season in a home and home series that should provide another round of terrific hockey. In the meantime, Utah will head to Cheyenne to take on the Stampede, who are coming off of their best weekend of the season. The Stampede just took two of three games from the Steamboat Wranglers, and are right now in a race to try and gain ground in hopes of earning a home playoff series against the Wranglers. Stay tuned for more information as the Outliers race down the home stretch towards the playoffs.